If a graphic designer, even one with a scientific background, is going to understand, and contribute to, the visual communication within a scientific peer group then there is a lot to learn. This glossary lists all of the neuroscience terms and acronyms that Gill has had to follow up (with grateful thanks to wikipedia). Amygdala – a group of nuclei situated deep and medially within the temporal lobes of the brain. Antagonist – a substance that binds to a receptor and blocks the activity of that receptor. Anxiolytic – a medication or other intervention that inhibits anxiety. ASL, Arterial spin labelling – a non-invasive MRI technique to measure cerebral blood flow (CBF). Autoradiography – a technique using X-ray (or occasionally photographic) film to produce an image of the 2D distribution of a radioactive substance. The auto- prefix indicates the radioactive substance is within the sample. Blood-brain barrier (BBB) – a highly selective semipermeable membrane barrier that separates the circulating blood from the brain and extracellular fluid in the central nervous system. Bowman’s glands – also known as olfactory glands, situated in the olfactory mucosa, beneath the olfactory epithelium. Cannula – a tube that can be inserted into the body, often for the delivery or removal of fluid. CBF, Cerebral blood flow – the blood supply to the brain in a given period of time. In an adult, CBF is typically 750ml per minute or 15% of the cardiac output. Cingulate cortex – a part of the brain situated in the medial aspect of the cerebral cortex, lying immediately above the corpus callosum. Corpus callosum – a broad band of nerve fibres joining the two hemispheres of the brain. 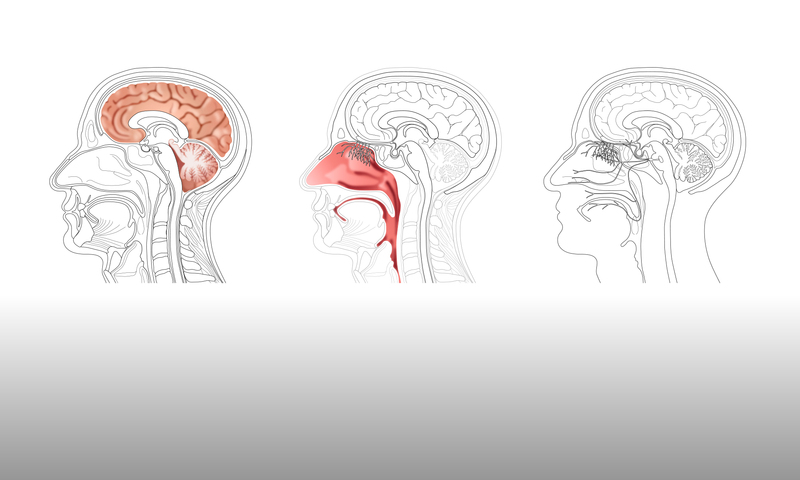 Cribriform plate – a sieve-like structure between the brain and the nasal cavity, which supports the olfactory bulb. CSF, cerebrospinal fluid – a clear, colourless body fluid found in the brain and spinal cord. Dopamine – a neurotransmitter that affects emotions, movements and sensations of pleasure and pain. Dosimetry / radiation dosimetry – in the fields of health physics and radiation protection, is the measurement, calculation and assessment of the ionising radiation dose absorbed by the human body. DTI, Diffusion tensor imaging – an MRI-based neuroimaging technique that makes it possible to estimate the location, orientation and anisotropy of the brain’s white matter tracts. DWI or DW-MRI, Diffusion-weighted magnetic resonance imaging – an imaging method that uses the diffusion of water molecules to generate contrast in MR images. Endocytosis – a form of active transport in which a cell transports molecules into the cell by engulfing them in an energy-using process. Endogenous – having an internal cause or origin, e.g., endogenous oxytocin is produced within the brain. Epithelium, epithelia – continuous sheets of cells that cover a body surface or line a body cavity. Executive functions – a set of cognitive processes that are necessary for the cognitive control of behaviour. Exogenous – having an external cause or origin. Fallypride – a high affinity dopamine D2/D3 receptor antagonist used in medical research, usually in the form of fallypride (18F), as a PET radiotracer in human studies. FDG, Fluorodeoxyglucose (18F) – a glucose analog, with the positron-emitting radionuclide fluorine-18 substituted for the normal hydroxyl group at the C-2 position in the glucose molecule. Used as a radiopharmaceutical in PET imaging. Fluorodopa (F-DOPA, 18F-DOPA) – a fluorinated form of L-DOPA primarily synthesised as its fluorine-18 isotopologue for use as a radiotracer in PET imaging. Fornix – a C-shaped bundle of nerve fibres in the brain that acts as the major output tract of the hippocampus. Herring bodies – neurosecretory terminals found in the posterior pituitary. They represent the terminal end of the axons from the hypothalamus and hormones are temporarily stored in these locations. Homologue (in chemistry) – a compound belonging to a series of compounds differing from each other by a repeating unit. Insula, insular cortex – a region in each hemisphere of the mammalian brain, positioned deep within the cortex. Intracellular transport – the movement of vesicles and substances within the cell. Isotopologues – molecules that differ only in their isotopic composition. The isotopologue of a chemical species has at least one atom with a different number of neutrons than the parent. Limbic brain, limbic system – set of brain structures either side of the thalamus, including the amygdala, hippocampus, thalamus, hypothalamus and basal ganglia. Magnocellular neurons – large neurons within the SON and PVN of the hypothalamus. Oxytocin and vasopressin can be released within the brain from dendrites as well as into the blood from terminals in the posterior pituitary. Mid-sagittal plane – an anatomical plane, also termed the median plane, that divides a body into left and right halves (assuming bilateral symmetry). MRI, Magnetic resonance imaging – an imaging method that uses strong magnetic fields and radio waves to produce detailed images of the inside of the body. Nares – the scientific term for many animal, and specifically bird, nostrils. Anterior nares – the external or frontal part of the nasal cavity. NFTs, Neurofibrillary tangles – aggregates of hyperphosphorylated tau protein that are most commonly known as a primary marker of Alzheimer’s disease. Neurohypophysial hormones – a family of structurally and functionally related peptide hormones. The main representatives are oxytocin and vasopressin. Neurohypophysis – another name for the posterior lobe of the pituitary gland. Neurotransmitter – a chemical released by neurons to send signals to other neurons. Optic chiasm – an X-shaped structure formed by the crossing of the optic nerves in the brain. Oxytocin – a neurohypophysial hormone. It plays a role in social bonding, sexual reproduction in both sexes, and during and after childbirth. Paracellular transport – the transfer of substances across an epithelium by passing through the intercellular space between the cells. Paravascular spaces – CSF-filled channels surrounding blood vessels in the brain. Parenchyma – the functional parts of an organ in the body. Parvocellular neurons – small neurons within the PVN of the hypothalamus, that release peptides into blood vessels in the pituitary gland. Passive diffusion, passive transport – the movement of molecular substances across cell membranes within need of energy input, due to a concentration gradient or gradual difference in solute concentration. Perineuronal – surrounding a neuron. PET, Positron emission tomography – a nuclear medicine functional imaging technique. The system detects pairs of gamma rays emitted indirectly by a positron-emitting radionuclide (tracer), introduced into the body on a biologically active molecule. Phantom / imaging phantom – a specially designed object that is scanned or imaged in the field of medical imaging to evaluate, analyse and tune the performance of various imaging devices. PVN, paraventricular nucleus – a nucleus of magnocellular neurosecretory cells in the hypothalamus of the mammalian brain, that release oxytocin into the general circulation. RNAi, RNA interference – a biological process in which RNA molecules inhibit gene expression or translation, by neutralising targeted mRNA molecules. SON, supraoptic nucleus – a nucleus of magnocellular neurosecretory cells in the hypothalamus of the mammalian brain, that release vasopressin into the general circulation. SPECT, Single-photon emission computed tomography – a nuclear medicine tomographic imaging technique using gamma rays. Striatum – the major basal ganglia recipient of the cortex and all other inputs to the basal ganglia. A critical component of the motor and reward systems, which receives glutamatergic and dopaminergic inputs. SUV, standardised uptake value – a nuclear medicine term, used in PET and SPECT imaging for a (semi)quantitative analysis. Synapse – a structure that permits a neuron to pass an electrical or chemical signal to another neuron. T-test – a t-test assesses whether the means of two groups are statistically different from each other. Teleost – a fish of a large group that comprises almost all of the ray-finned fishes. Tractography – a 3D modeling technique used to visually represent neural tracts using data collected by diffusion-weighted images (DWI). It uses special techniques of magnetic resonance imaging (MRI) and computer-based image analysis. Transcellular transport – the transfer of substances through a cell, passing through cell membranes. Trigeminal nerve – largest of the twelve cranial nerves, responsible for sensation in the face and motor functions such as biting and chewing. Uptake – the absorption and incorporation of a substance by living tissue. Vasopressin – a neurohypophysial hormone in mammals. Its two primary functions are to retain water in the body and to constrict blood vessels.